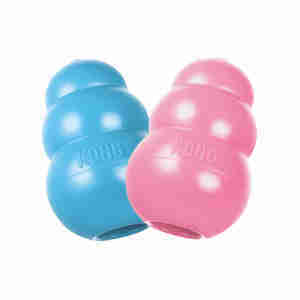 The Puppy KONG dog toy is customized for a growing puppy's baby teeth, the unique, all-natural rubber formula is the gentlest KONG out there. Designed to meet the needs of a puppy's teeth, it helps teach appropriate chewing behaviour while offering enrichment and satisfying a younger pup's instinctual needs. A stuffed Puppy KONG occupies busy little ones mentally. Add to the fun by including KONG Puppy Snacks and top with KONG Puppy Easy Treat. Recommended by veterinarians and trainers worldwide. Kept my puppy entertained for a while. He loves it. They are strong and long lasting. Didnt come in the colour advertised though. As it said on tin! Not same colour as picture in advert but same thing. Kongs are such a brilliant invention for dogs of all ages. Keeps them busy for ages. I would recommend having more than one though as they do need to be washed regularly. Excellent product and great quality. Our 10 week old puppy is kept busy for ages with it. Delivery time extremely quick too. Crazy bouncer just like your puppy..bullet proof, will hold a treat and fit neatly in your pocket for walks.